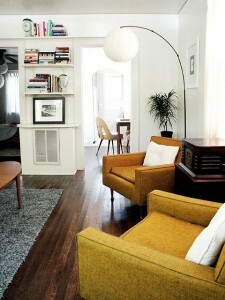 Last time I showed you a number of living room designs with what I call ‘power neutrals’ on the walls. These are neutral wall paint colours that don’t really generate strong reactions but they have enough about them that they can help create confident, balanced design schemes that show off the rooms themselves wonderfully. Read the post here if you missed it. 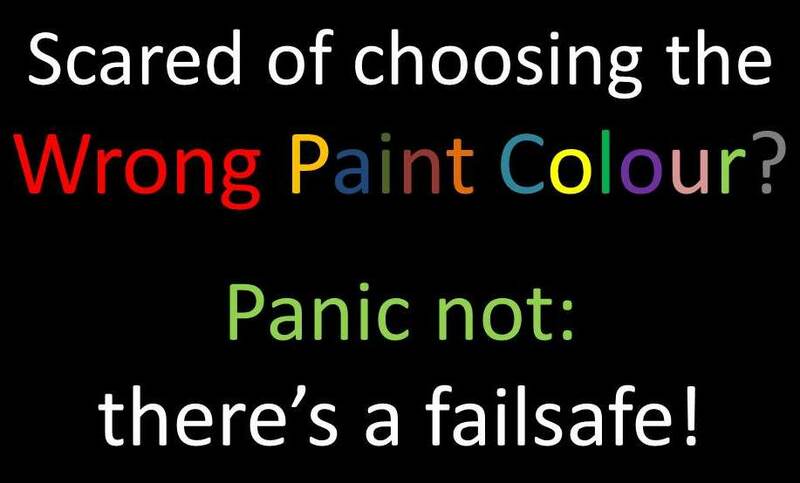 Now I know the world of colour choices can be a hideously complex one for some of you – heck, sometimes I feel completely paralysed with fear about choosing the wrong paint colour, so believe me when I say I understand! But panic not; I have a solution that can be made to work in almost any room. Now don’t get me wrong, simply painting all your walls and ceilings white will not in itself provide you with a fabulous-looking house – just look at this photo for proof. The first rule is that white must be flawless, clean and bright, whichever of the myriad of whites you actually choose to paint with. The second is that it rarely works on its own, without a well thought-out design scheme – just see left. A headboard and one brown cushion does not a beautiful design scheme make. But the good news is that white does make for an extremely versatile starting point, and leaves you to try out other colour choices for cheaper and simpler options like cushions, pictures, vases or rugs. Let’s start with rooms that are mainly white. 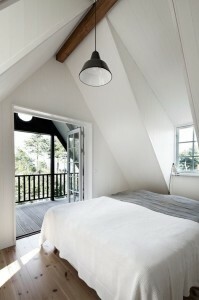 This room works because an all-white scheme allows the windows and rooflines become the main feature. In my opinion, this room works really well with an all-white scheme because of the architectural features. With the two windows, light is clearly a key feature of this room and the white only serves to emphasise that. White bedding is the height of luxury for most of us – there’s a reason many 5-star hotels use it as standard! Crisp white bedding helps provide an aspirational lifestyle feeling. The pale wooden flooring does just enough to ‘ground’ all the white, and the wooden beam provides the balance at the top of the image. A black light fitting and black railings on the balcony give the contrast that brightens the white even further, and the soft grey throw on the bed gives just enough texture and warmth to stop it from being cold and stark. In short, white was the perfect choice for this room so the room itself is centre stage. This next room is made less stark by the addition of soft, pale colours and textures, but for me it lacks the grounding element that a darker, contrasting colour can provide. There are some darker elements, but they’re taking the role of the 10% accent colour instead of the more usual 20% contrast factor. The problem for me with this image is that my eye doesn’t settle on one part of this image, it darts around looking for something to focus on, and it doesn’t make me feel comfortable. Part of that is to do with my own personal taste, but I’d guess that many of you might feel the same because it’s more of a balance and contrast issue than of taste. It’s also a scheme that I would suggest will appeal more to females than males, and while it may be that the female usually makes the final decision on house purchases, it doesn’t do to go too far one way and alienate most of your male buyers. This white scheme is grounded with the dark wood of the furniture. It’s easier to photograph than the middle picture, because the dark wood provides balance and contrast. Here’s another mainly white scheme, this time with lots of grounding elements provided by the dark wood of the furniture. It’s very balanced and has lots of contrast, so for me it’s a pleasing photograph. Note how all of the wood is the same colour – it’s best to stick to the same colour and tone of wood in one room. Mixing woods can work, but it’s a risk and when you’re selling it’s best to stick to what you know will work. The actual style of the room is a little ‘cottagey’ and perhaps less modern than the previous two, but it would be well-suited to an older property where ultra-contemporary design would be completely out of place. It could also be easily adjusted by adding some accent colour accessories. 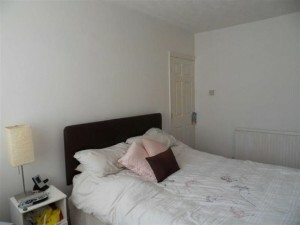 In fact, let’s have a look at white rooms with accent colours! 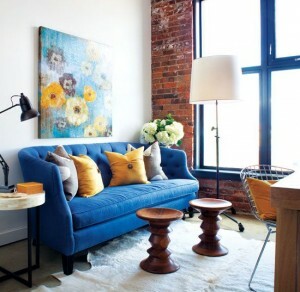 This living room looks great with its bright blue sofa. The window frames are either painted a similar blue or are taking on the blue of the sofa in the reflection so either way, they help balance the blue across the photo. The mustard yellow cushions on the sofa and the chair add a great complementary but vibrant accent colour which is picked up again in the artwork. The white wall is the perfect completely neutral backdrop to all this drama, allowing the blue and yellow to take centre stage. Relaxing, fresh, inviting. Green and white are very good together! Here’s a more subtle use of colour with white: this is a perfect example of the 70:20:10 rule working really well. 70% is white, 20% is brown/beige and the remaining 10% (ish!) is green. All of the colours are subtle and muted so they blend really well, and the white helps the green to look fresh without it having to actually be a bright green colour. This is a lovely design scheme that would work really well for a sale house. If you want to try this sort of look in your own house, just have a look at the colours of the major items in the room (walls, furniture, flooring). You either work with these or change them, but if you’re working with them you’ll need to take out much of the other colours in accessories, artwork and fabrics, leaving only those that you choose for your accent colour. 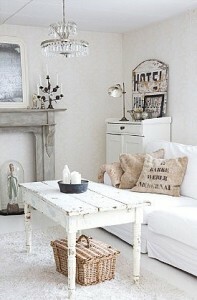 Grounded white room with a lovely retro feel that is very popular right now. Finally, here’s a white room I really love. It’s very neutral with its white walls and ceiling, ‘grounding’ wooden floor and the muted yellow of the chairs providing interest, but the colour simplicity lets the style of the items shine through. Whereas the first image I showed you used the white to let the architectural features be the star of the show, in this scheme the white is allowing the design of the furnishings and accessories to be at the forefront. There are lovely retro touches to this design but it wouldn’t be out of place in a very contemporary new development, a renovated warehouse apartment building or a Victorian terrace; it’s very versatile and I love it! I’d love to see how you use white in your own rooms. Send me pictures to anna@annahartconsultancy.co.uk and I might do a follow-up featuring your images!